Running late today, no time to shop, driving home and thinking… dinner at 7:00…what do I have that’s fast and delicious. 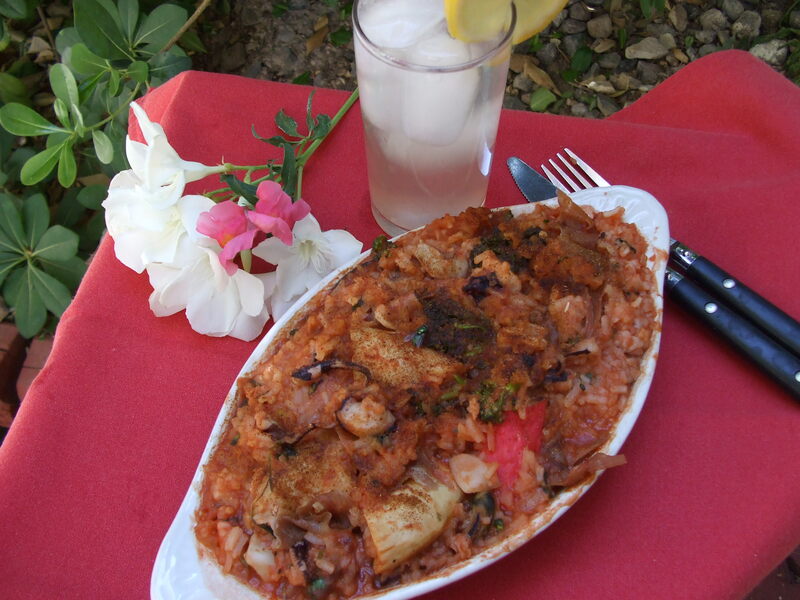 Still have mixed seafood, 1 chicken breast, kielbasa, rice, canned tomatoes…hmmm…paella. I have garlic, onions, saffron, cilantro, wine, stock. Yes, paella it is…on the stove top…too hot to turn on the oven! I made lavender lemonade Monday. Add a little bubbly (or a lot of bubbly) to that and make a salad. Enough!!! Voila, romantic dinner for 2. You’ve got to give this a try. In a 2-quart sauce pan over medium heat, fry sausage until fat is released. Add onion, garlic, and bell pepper. Cook until wilted and fragrant. Add wine and stir to the bottom of the pan. Add rice, stock, tomatoes, saffron, cilantro, bay leaf, Tabasco, salt and pepper. Stir. Cover pan and simmer for 14-15 minutes. Add seafood, continue simmering until rice is done and seafood is pink (about 5 minutes). If you haven’t got saffron, use annatto oil or turmeric and paprika. Use sweet Italian sausage or pieces of leftover pork chops instead of kielbasa. You can add peas, green beans, artichokes, or broccoli florets. Make this dish with just chicken or pork. This entry was posted on May 20, 2009 at 6:26 PM and is filed under Main Dishes. You can follow any responses to this entry through the RSS 2.0 feed. You can leave a response, or trackback from your own site. Wow. That paella looks delicious. I’d eat it now and its not even 9am! Thanks Sara for dropping by, and I ate the rest of the paella for a midnight snack. It was still yumm.